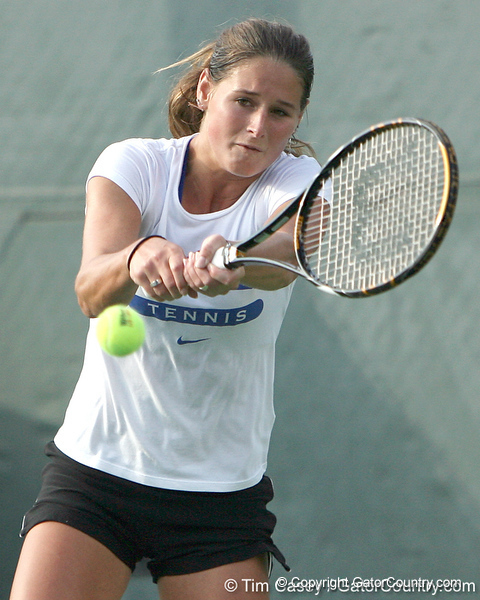 Browse our Florida women's tennis 2009 images and to see the article visit us on GatorCountry. The seventh-ranked University of Florida women’s tennis team opened its dual match against Stetson needing just 29 minutes to sweep all three doubles matches en route to a 6-1 victory Tuesday at Linder Stadium at Ring Tennis Complex. The win, which was the Gators’ 67th consecutive regular-season home victory, provided head coach Roland Thornqvist with the 250th victory in his career and the 175th in his eight years at the helm of the Florida program. The Gators also improved to 7-0 against Stetson (0-1), while winning their 24th consecutive match against other teams from the state of Florida. Florida’s No. 2 doubles team of Jessica Alexander and Anastasia Revzina zipped past Valentina Galbarini and Natalie Gorham, 8-0, in 25 minutes, three minutes ahead of the Gators’ 18th-ranked doubles team of Megan Alexander and Marrit Boonstra, who blanked Breanna Atkinson and Katherine Nowicki to clinch the doubles points. Joanna Mather and Barbara Pinterova punched in their sweep a minute later. The Gators (2-0) carried the momentum from their dominating doubles performances onto the singles courts, where they produced straight-set victories at the five completed matches. UF’s Jessica Alexander retired from her No. 5 match to rest an injury after leading 3-0 in the first set. Junior Megan Alexander provided the clinching dual match victory, defeating Katherine Nowicki, 6-3, 6-1 on court No. 3, breaking the Hatter at love in the final game, to collect her 50th career singles win. Revzina was the first Gator to post a singles victory during the dual match, opening her No. 2 bout with a break of Breanna Atkinson en route to winning the first four games of the match. Revzina turned up her game to earn the decisive 6-1, 6-1 victory in 53 minutes, giving the Gators a 2-1 lead. Mather was the next Gator off the court, as she held at love to begin her No. 4 match, racing out to a 5-0 lead before Shannon Gunning got on the board. The Hatter held to open the second, but the Gator rookie earned breaks in the third and fifth games, while never giving up her serve, as she claimed the 6-1, 6-2 decision in 61 minutes. Boonstra again played the No. 1 singles spot and claimed the 6-2, 6-2 victory over Valentina Galbarini. The Gator junior earned breaks in the first, fifth and seventh games to take the opening frame, before striking again in the third and fifth games of the second, holding serve throughout the set and ending by holding at love. Pinterova collected early breaks in both of her sets against Natalie Gorham and road those throughout as the Hatter tried to rally. The Gator newcomer, however, dug deep and prevented a comeback by earning a break in the important eighth game after Gorham had just broken and was at the baseline trying to get the set back on-serve. Pinterova withstood the pressure of being the last match on court and capped the event by serving out for the 6-4, 6-4 victory and provide the final margin of the team score. Florida continues its busy week, next playing host to the first and second rounds of the ITA National Team Indoor Championships on Saturday and Sunday. The Gators face Oklahoma State in the opening round at 10 a.m., before South Alabama and Western Michigan play at 2 p.m. The early rounds of the 64-team event can be played on outdoor courts, as UF and the Ring Tennis Complex earned the right to host the opening stages of the tournament. Men’s action gets underway on Friday at 10 a.m., with second round competition on Saturday. Admission to all matches is free. Florida freshman Jo Mather competes during the No. 7-ranked Gators' 6-1 win against the Stetson Hatters on Tuesday, January 27, 2009 at Linder Stadium in Gainesville, Fla.